I already gave my statement to the police but I'm telling you now, Clara didn't kill nobody! I've known her for years - even before her husband died. She's not a killer. Who could even think such a thing? I supply everything Clara and her niece, Maggie, need to keep Pie in the Sky running. Fresh fruit for the insides, and vegetable shortening for crust. Cream and chocolate. Now even coffee for Maggie's espresso machine. That man, Donald Wickerson, dying right here in the middle of the pie shop - bad business. Nothing to do with Clara or Maggie. I heard Clara was dating that Wickerson fella but I read in the newspaper that he's no good. Killed his wife or something. Why was he even out on the street? I swear criminals got it better than the rest of us. I wasn't at the pie shop when Wickerson was killed. I just thought the police should hear from someone on Clara's side, you know? She's one of my best clients. She pays on time and always has a piece of pie and a smile for me. A kind heart - that's what she is. Maggie too. I remember her growing up here and working at the pie shop with her aunt and uncle. Never saw a sweeter girl, know what I mean? Now she's back in Durham, what a difference at the pie shop. I hope the holidays aren't ruined for them by all this mess. I hope Pie in the Sky stays open too. Geez! I'd hate to lose the place. 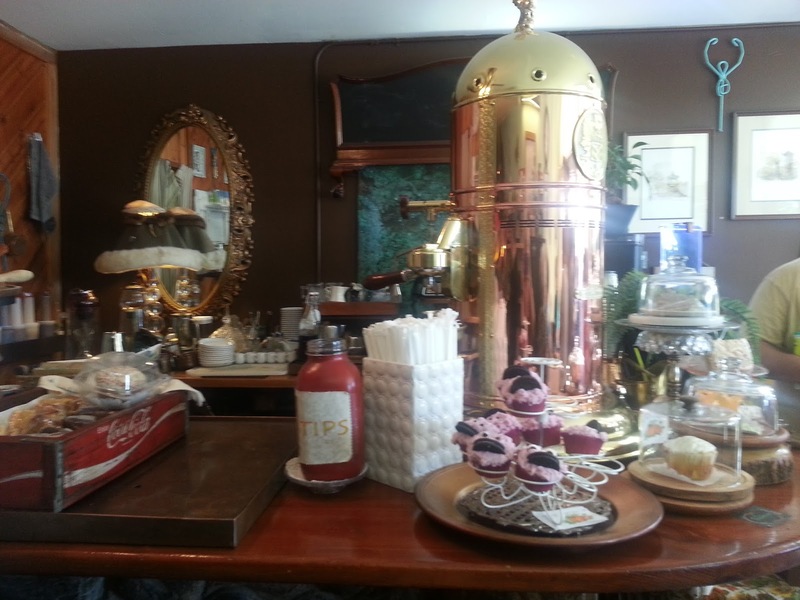 Best coffee and pie in the city! YOU COULD WIN A COPY OF TREACHEROUS TART BY LEAVING A COMMENT THAT INCLUDES YOUR FAVORITE PIE AND AN EMAIL! WINNERS WILL BE NOTIFIED BY EMAIL. What fun! A new series for me to get!!! I am a pie lover.....lemon merigue being the number one favorite!!! I would love to read this book—thanks for the opportunity to win a copy! My favorite pie is key lime pie! Candace7399@aol.com. cherry pie is my favorite. Ah, sweet potatoe pie is by far my favorite! Fun book idea! Gooseberry. Or blackberry. Or rhubarb (but not with strawberries). Cherry! No, wait, chocolate pecan! Or gooseberry. Or . . . sigh, I love pie. French apple pie is my favorite...but, I have an affinity for any pie...and coffee, of course. Looking forward to Treacherous Tart! pecan pie with cinnamon ice cream! It's hard to pick a favorite---a toss up between pecan and lemon meringue. If I'm feeling autumnal, apple pie comes to mind. If I'm feeling totally decadent, Toll House Cookie pie! Home made Peach Crumb - or blueberry. YUM! Book sounds like a great read. My favorite go to pie is Dutch Apple . . . especially when there's a scoop of vanilla on top! My favorite is rhubarb. The one on this page looks perfect! I want some right now! This book sounds "yummy"! Would go well with blueberry pie.....my father's favorite! Oh I love pies. Pumpkin is my favorite. I love pumpkin with lots of whipped cream. I also loved the first book in this series. Mine is banana cream pie. 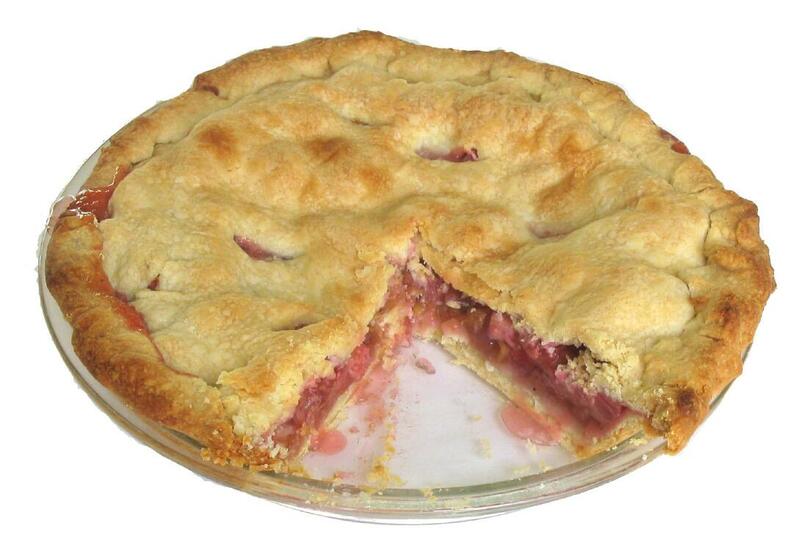 It's been ages since I had rhubarb pie. My favorite would have to be mulberry pie. RHUBARB PIE no strawberry in it. I spent early summer buying RHUBARB, cutting it up and freezing it. I will be having it for Thanksgiving!!!!! pecan pie is my favorite, but yum! 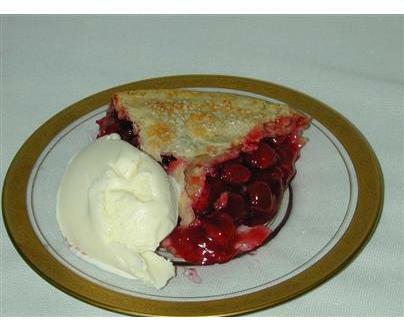 that cherry pie looks good! Thanks for all the great pie suggestions! Debby, Valerie, and Brooke are my winners! Thanks to everyone for being here!